Yeah, but: They can be hard to find. 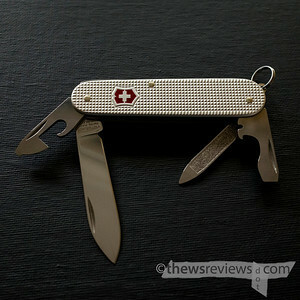 The Long Version: The Victorinox Cadet is one of the best Swiss Army Knives. At a modest 84mm length, with just two tool layers and Alox scales, this thing just disappears into a pocket until it's needed. Of all the knives I have, this is the one I can recommend to just about anyone without needing to know the specifics of where and how they'll use it. Besides, it's fairly cheap. The Cadet is the knife that taught me that Swiss Army Knives don't need to be bulky plastic-handled four-layered boxes that aspire to be Swiss Champs. It has the standard openers layer, a large blade, and a nail file. As usual with Alox knives, there are no back-side tools, toothpick, or tweezers, but the metal scales lets this knife be the thinner than the single-layered Cellidor Bantam. While I like the classic red Cellidor handles, and their iconic visibility makes the knife seem harmless, there’s no doubt that the textured Alox handles give a better grip. There are knives that I carry because I like them, others that I carry because I like to use them, and those that I carry because I need them. 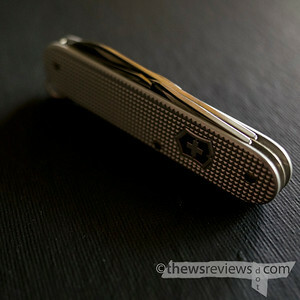 The Victorinox Cadet is one of the few knives that falls into all three categories: an attractive-but-utilitarian design and small size make it a pleasure to carry, it's equipped with a great blade that's big enough for actual work, and has other useful tools that expand its usefulness beyond what a single-blade knife can do. Another way that I think about utility knives is to contrast how easy they are to carry with how useful they're likely to be for work. A small keychain knife is incredibly easy to carry with the tradeoff that it's not all that useful most of the time, while a folding knife over 3" or so can do a lot of cutting but requires a lot more dedication – and justification – to cart around. Once again my Cadet hits this sweet spot for me, being suited for near-ubiquitous carry and yet capable enough that I rarely feel the need to use something bigger. Yes, if I'm breaking down a skid-sized shipment then I'll reach for my Sebenza, but that's maybe a once-a-week thing, while I can use my Cadet several times a day. 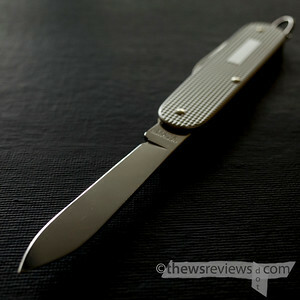 The only real problem with the Alox Cadet is related to its strength of slimness: its ability to disappear. Mine went missing, making it only the second knife-bearing tool that I've ever lost. I hope that I find it somewhere in the house some day, or failing that, that someone else finds it, uses it responsibly, and falls in love with it the way I did. I liked mine so much, in fact, that I eventually went out and bought another one. Excellent description. Makes me want to find it and bring it home. I have the "Electrician" with similar finish, and a few more tools. It is a true workhorse. Hope you find your missing knife. My loss--slipping out of my pocket in my car seat, just before I traded the car. The Electrician, with its sheepsfoot blade, remains my favourite work knife. Even though the difference between its 93mm size and the Cadet's 84mm doesn't sound like much, it makes a huge difference in the feel and carry of the knives. The Cadet serves well as its smaller companion.